English comes in many flavors around the world. While you might be aware that each variety of English has its own set of spelling conventions, there are some subtle differences in grammar and punctuation usage, too. 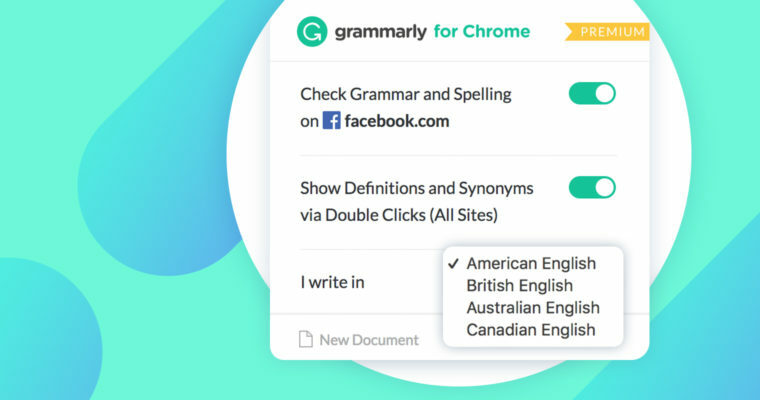 Grammarly’s writing tools offer settings for four English dialects: American, British, Canadian, and Australian/New Zealand. If you’ve ever wished that Grammarly would stop flagging you for writing “flavour” (or wished that it would start), updating your dialect preferences will make a world of difference. You can update your dialect setting in any Grammarly product. It will be saved with your other account preferences, so you’ll only need to do it once. When you use other Grammarly products or other devices, your preferred option will be automatically selected, as long as you’re signed in to your Grammarly account. First things first: make sure you’re logged in to your Grammarly account. Visit your document dashboard and click “Profile” on the left side of the screen. Navigate to the “Language preference” tab and select your dialect from the dropdown menu. Open Grammarly from the app menu on your mobile phone and tap “Grammarly Settings.” Next, tap “Language Preference” and choose your preferred setting. How do dialect settings change your writing feedback? Different dialects of English contain some subtle variations, particularly in written form. You may already know that some English speakers write “center” while others write “centre.” But there are a number of grammatical and punctuation differences, too. Grammarly helps you ensure that your writing follows the conventions of a single dialect. Read on for some examples. If you compare British and American English, you’ll find spelling differences that concern vowels, double letters, and suffixes such as -ize/-ise or -yze/-yse. Australian and New Zealand English tend to follow the same conventions as British English. Canadian English often uses the spellings found in British English, but occasionally uses variants that appear in American English, too. American: I didn’t realize your favorite color is green. British: I didn’t realise your favourite colour is green. Canadian: I didn’t realize your favourite colour is green. New Zealand/Australian: I didn’t realise your favourite colour is green. There are a few subtle differences in grammar among English dialects. For example, in American English, collective nouns take only a singular verb, but in British, Canadian, and Australian English, they can take a singular or plural verb. American: My family is fond of parties. Non-American: My family are fond of parties. Punctuation conventions vary a bit among English dialects. Writers in Britain, New Zealand, and Australia do not insert periods after titles, while American and Canadian writers do. For quotations, Americans and Canadians use double quotation marks and put commas and periods inside them, whereas British, New Zealand, and Australian conventions vary widely among different style guides and publications. American/Canadian: I wouldn’t buy a used car from Mr. Doe. British/New Zealand/Australian: I wouldn’t buy a used car from Mr Doe. American/Canadian: “I’ve finished my homework,” said Mark. British/New Zealand/Australian: “I’ve finished my homework,” said Mark. British/New Zealand/Australian: ‘I’ve finished my homework’, said Mark. How Do Grammarly’s Products Work?